Explanation: A mere 2.5 million light-years away, the Andromeda Galaxy, also known as M31, really is just next door as large galaxies go. In this (inset) scan, image data from NASA's Nuclear Spectrosopic Telescope Array has yielded the best high-energy X-ray view yet of our large neighboring spiral, revealing some 40 extreme sources of X-rays, X-ray binary star systems that contain a black hole or neutron star orbiting a more normal stellar companion. In fact, larger Andromeda and our own Milky Way are the most massive members of the local galaxy group. 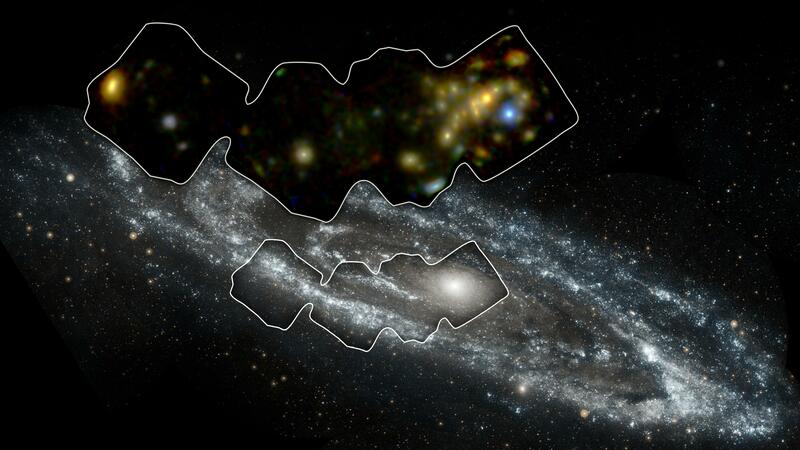 Andromeda is close enough that NuSTAR can examine its population of X-ray binaries in detail, comparing them to our own. The background image of Andromeda was taken by NASA's Galaxy Evolution Explorer in energetic ultraviolet light.